Image above shows the HQ troop of No.10 Inter Allied Commando. The thirty-eight Battle Honours awarded to the Army commandos serve as a Prologue to this brief history of their five years’ Active Service. Look at the list and you will see that they were not the most peaceable operations of the Second World War. But these were only the most famous of countless fights in which these units played their part. A summary of the decorations awarded to officers and men of the Army Commandos gives some indication of their prowess. Eight won the Victoria Cross; thirty-seven the Distinguished Service Order, with, in addition, nine Bars to that award; one hundred and sixty-two Military Crosses, with thirteen Bars; thirty-two Distinguished Conduct Medals; and two-hundred and eighteen Military Medals. But only the most fortunate, the most outstanding, won these distinctions, chosen from a host whose devotion and bravery was not less marked for being unrewarded. This unique record of the Army Commandos owed more than anything to the fact that every man was a volunteer. He was, moreover, a picked volunteer, selected by officers who trained him and led him in battle. Those who failed for one reason or another to measure up to the most exacting standards of training, discipline and conduct under fire, could be Returned to Unit without more ado. Not a few were. This process of survival of the fittest became twofold. From 1942 onwards every new recruit had to pass through the Commando Depot at Achnacarry before he was posted to his unit. Nobody who survived it would question the practical severity of this ordeal in the days when Lieut-Colonel Charles Vaughan, O.B.E., at once exacting and benevolent, ruled in Lochiel’s place. 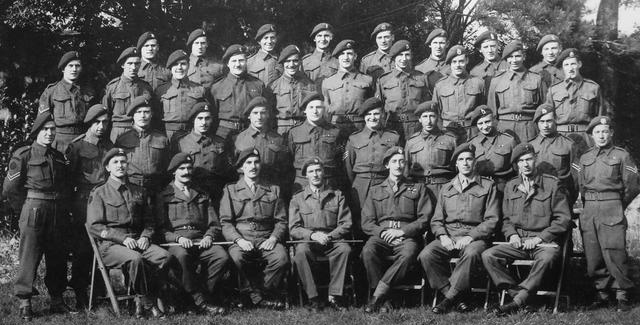 This was the background: the men who organised the Commandos were content with nothing short of perfection. From the first day they set about learning the tactics and techniques of war, and devising new ones; no detail was too insignificant. And yet, though no plan was too bold, mere foolhardiness was generally condemned. This attitude, evoking a certain spirit of emulation in the field army, helped in some measure to disperse the clouds of convention which afflicted our military thinking in 1939. The Army Commandos were formed in June 1940, at a time when the British Empire no longer had a single ally in the field, and when the British Army had been compelled to quit the continent of Europe as a result of the disastrous campaigns in Norway and the Low Countries. While the germ of the idea had originated in the brain of Lieut-Colonel Dudley Clarke R.A., as early as 4th June, 1940, it was Winston Churchill himself who, not content with a purely passive defensive, actually ordered their formation. In a minute of 18th June, 1940, he wrote: “What are the ideas of C.-in-C., H.F., about Storm Troops? We have always set our faces against this idea, but the Germans certainly gained in the last war by adopting it, and this time it has been a leading cause of their victory. Their ought to be at least twenty thousand Storm Troops or ‘Leopards’ drawn from existing units, ready to spring at the throat of any small landings or descents. These officers and men should be armed with the latest equipment, tommy guns, grenades etc., and should be given great facilities in motor-cycles and armoured cars.” The first Commando raid took place only five days later. Towards the end of June, 1940, the first of twelve Commandos came into being. Nos. 1 and 2 were formed a little later the same year from the Independent Companies raised from the Territorial units at a time of the Norwegian campaign. No 10 was raised among our allies, French, Polish, Norwegian, Belgian, Dutch, Yugoslav and - curiously enough – German; the remainder were raised from the field army. Comparatively few had seen active service in Norway or with the B.E.F., though here and there were more experienced soldiers: in H Troop of 3 Commando, for example, nearly every man was a reservist who had done his seven years with the Colours, and after being recalled in 1939 had fought with the 4th Division in the Dunkirk campaign. At first each Commando consisted of ten troops, each of fifty men, but this somewhat unwieldy organisation was altered early in 1941 to six troops of sixty-five, a great improvement. Hilary St. George Saunders has told the story of the Commandos in his book The Green Beret, and it is not possible here to describe their many raids and campaigns in any great detail. The exploits of individuals, and the countless minor raids performed, striking though they were, must for the most part be sought elsewhere. The battle honour Norway, 1941, belongs to Nos. 3 and 4 Commandos for the raid on the Lofoten Islands (4th March) – which, though bloodless, struck a telling blow at the German war economy – and in some measure to Nos. 6 and 12, who were also engaged in raids on Norway. The most important of the Norwegian operations was the well planned attack on Vaagso (27th December, 1941), a classic example of a raid. The military force, under Lieut. Colonel J.F. Durnford-Slater, R.A., consisted of his own Commando, No. 3, and a strong detachment from No. 2. The German garrison was destroyed and 102 prisoners taken – the first time in the war that any quantity of German soldiers had been captured; a cast defence battery was blown up; about 18,000 tons of shipping and countless fish oil factories destroyed – at a cost of twenty killed and fifty-seven wounded. In February, 1941, Lieut. Colonel R.E., Laycock had sailed for the Middle East with Nos. 7, 8 and 11 Commandos – Layforce. Their first raid, on Bardia (19th April) had disappointing results. Then in May Nos. 7 and 8 and a composite Commando were sent to reinforce the garrison in Crete and to cover its withdrawal in the face of German airborne troops. By a prolonged and desperate rearguard action they gained time for the main evacuation at Sphakia, though not without heavy loss. No. 11, a Scottish Commando, greatly distinguished itself at the passage of the Litani River, Syria. An Australian force, advancing from Palestine, was held up by strong French Colonial detachments, but the Commando, landing from the sea, turned the position, capturing many guns. A detachment of No. 8 Commando went all through the first siege of Tobruk, sharing the dangers and hardships of the garrison, and raiding the Italian lines with great success. The celebrated raid on Rommel’s Headquarters (17th November, 1941) was carried out by a party from No. 11 Commando. In this operation Lieut. Colonel Geoffrey Keyes won the Victoria Cross. By this time Nos. 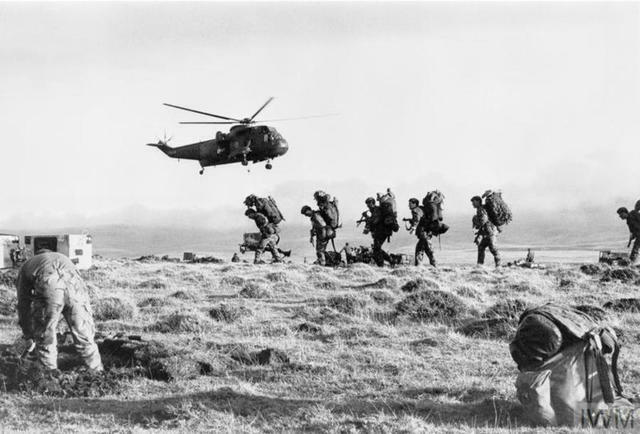 7, 8 and 11 Commando had suffered so many casualties that Layforce was disbanded, its commander returning to England to command the Special Service Brigade. During February, 1942, the first of two Volunteer Royal Marine Commando Units came into being and was known as No. 40 Commando, No. 41 Commando was formed in October the same year. The raid on St. Nazaire (28th March, 1942), the greatest and most desperate of all, was the work of No. 2 Commando and demolition parties from 1, 3, 4, 5, 9 and 12 Commandos. The great dry dock, the Forme Ecluse, the only one on the Atlantic seaboard capable of holding the Tirpitz, was put out of action for the rest of the war, and the German battleship was compelled to remain in Norwegian waters until the R.A.F. capsized her near Tromso in September, 1944. In this action Lieut. Colonel A.C. Newman (2 Commando) and Sergeant Thomas Durrant (1 Commando) won the Victoria Cross. No. 5 Commando had its baptism of fire in the invasion of Madagascar (May, 1942), and was at the capture of Diego Suarez and the seizure of Tamatave. Two Army Commandos took part in the great raid on Dieppe (19th Aug, 1942), their targets being the coastal defence batteries. The landing craft of No. 3 Commando ran into a German convoy, and was scattered during the night, but two small parties landed. One was overwhelmed, but the other engaged the Berneval battery for some hours. At Varengeville No. 4 Commando, under Lord Lovat, M.C., carried out a classic operation of war, completely annihilating the battery and its garrison after a well-planned and dashing assault. In this action Captain P.A. Porteous, R.A., won the Victoria Cross. Nos. 1 and 6 Commandos, after taking part in Operation “Torch”, the landings in North Africa (November, 1942) served throughout the Tunisia campaign as part of the field army “from Fort Duperre in Algiers to the White House at Douar, the Green Hill near Sedjenane, and the green plain of Goubellat…” learning, “to apply the lore of Achnacarry in a bitter land of rain and rocks…” and proving that Commandos, though raised for seaborne landings, could turn their hands to anything. Their Corps Commander, addressing them at the end, said: “You have done jobs normally done by parachutists, infantry and Commandos. You have carried out raids, long-range patrols, protracted periods of defence – a role for which you were not designed – and have done further landings.” The men of 1 and 6 Commandos returned to England, veterans. No. 3 Commando next saw service in the Sicily landings, destroying an Italian coastal defence battery covering the beach at Cassibile on the night of 10th July, 1943, and landing again only four days later to capture the Ponte de Malati, near Lentini. By preventing the demolition of this vital bridge the Commando enabled the 50th Division to advance and relieve the paratroopers who had landed simultaneously at Primosole. After this operation General Dempsey, no mean judge, said, “The men of No. 3 are the finest body of soldiers I have seen anywhere,” while General Montgomery gave orders that the Ponte dei Malati should be renamed “No. 3 Commando Bridge”. The first landing in Italy, a series of reconnaissance raids around Bova Marina, were carried out in August, and since some sixty men were there over a week before the invasion, No. 3 could boast that it was the first British unit to get a foothold on the Continent after Dunkirk! The battle honour Salerno (September, 1943), was won by No. 2 Commando, under Lieut.-Colonel Jack Churchill, though at heavy cost. On one occasion, in a triumphant night attack, the unit took 136 German prisoners, more at that date than the whole Division to which they were attached had captured. 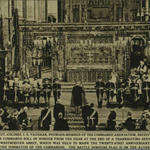 Salerno was a desperate business-at one time the Royal Navy was put at fifteen minutes’ notice to re-embark the troops. In the chaos and confusion of those grievous days No. 2 Commando was a tower of strength. On 3rd October a British force, including No. 3 Commando, now only about 150 strong, landed and captured Termoli, thus unhinging the German defensive position along the river Bifurno. The enemy counter-attacked violently. For a time confusion reigned and the situation was critical, but the great steadiness of the Commando troops under Durnford-Slater, saved the town. The 1st Commando Brigade (Nos. 3, 4, 6 and 45 RM., and the French troops of No. 10) came under the command of No. 6 Airborne Division throughout the Normandy campaign. Landing on the left of the British sector on D-Day, No. 4 Commando captured Ouistreham with great dash, while the rest of the Brigade succeeded in relieving the airborne troops who had captured the vital Benouville Bridge by a coup de main during the previous night. During the week that followed, the Brigade, under Lord Lovat, successfully defended the Amfreville Heights, from which the Germans hoped, in vain, to enfilade the British bridgehead. During the rest of the campaign the Brigade, commanded after Lord Lovat was wounded (12th June) by Brigadier D. Mills-Roberts, D.S.O., M.C., added to its laurels, particularly by the difficult night march which took the heights of Angoville (19th August), when three Commandos advanced in single file up a railway line, passed unseen through the German front line, and, as dawn broke, over-ran their second. The same technique, impossible to any but the most seasoned troops, was again employed in the advance to the Seine. After a brief spell in England, the Brigade went out to Holland and found itself holding a stretch of the River Maas. During this period Lance-Corporal H.E. Harden, R.A.M.C., attached to 45 R.M. Commando won the Victoria Cross. No. 3 Commando had some sharp fighting at Linne, but the Brigade’s next large-scale operation was the passage of the Rhine at Wesel. Intensive training and detailed planning were the key to this remarkable success, which cost the brigade less than a hundred casualties. The next obstacle tackled by the 1st Commando Brigade was the River Weser, where it was employed to reinforce a small bridgehead previously established. The passage of the Aller led to heavy fighting in woods beyond. No. 3 Commando and Brigade Headquarters were counter-attacked by the 2nd Marine Fusilier Battalion, who fought bravely, but were eventually routed when No. 6 Commando charged. The hunting horns sounded and, led by Lieut.-Colonel A.D. Lewis, they “went forward through the trees and at a fast double with bayonets fixed”. Few will argue with the historian of the Commandos who wrote: “The 1st Commando Brigade had shown themselves to be among the most expert soldiers the war had produced”. The Second Commando Brigade, which included the Polish and Belgian troops of No. 10 (Inter-Allied) Commando, fought from 1943 to 1945 in Italy, Yugoslavia and Greece. It was commanded first by Brigadier T.B.L. Churchill, M.C., and later by Brigadier R.J.F. Tod, D.S.O. 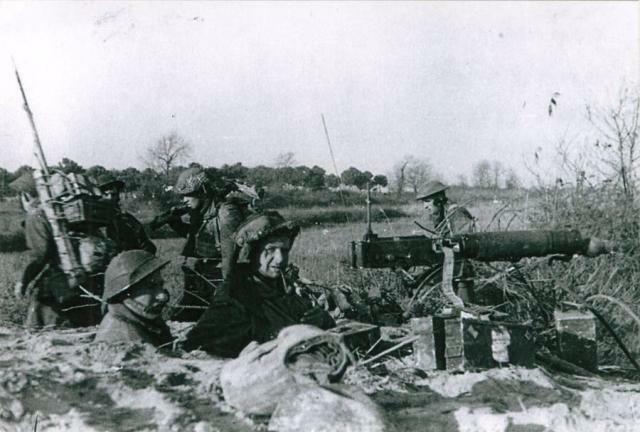 No 9 Commando first saw action when it raided German positions on the lower reaches of the Garigliano in December, 1943. There followed the Anzio landing (26th January, 1944) in which the Commandos met with little opposition. But when a few days later the Brigade was put in again to take Monte Ornito it was another story. Here they lost eleven officers, and one hundred and seventy-two other ranks, but the capture of the key to the defences of the River Garigliano was a notable achievement, and the Corps Commander, General McCreery, was loud in his praise of the “courage, enterprise and endurance” of the Commandos. In March the Brigade went ashore once again at Anzio, fighting this time in the infantry role, but displaying the usual aggression. Meanwhile, a force, including No. 2 Commando, was operating on the Dalmation Coast with its Headquarters on the island of Vis (December, 1943-October, 1944). No. 2 was commanded by Lieut.-Colonel Jack Churchill and his policy was, needless to say, to attack as often as possible. One of the most successful of Churchill’s raids destroyed the German garrison of the island of Solta (17th March, 1944), an operation which has been described as “a model of it’s kind”. Later the brigade occupied the Greek island of Kithera (September) and captured Corfu (October) before returning to Italy in February, 1945. On the night of 1st April the Commandos struggled across Lake Comacchio. Weeks of drought had lowered the water in the lagoon and for hours the men heaved and dragged their landing craft through the stinking, glutinous mud. Despite the inevitable confusion, the operation was a marked success. Corporal T.P Hunter, 43 R.M. Commando, won the Victoria Cross. The German losses included nine hundred and forty-six prisoners. This was followed by the capture of four islands in the middle of the lake, when Major Lassen, M.C., a Danish Commando, at the cost of his own life, won the Victoria Cross-the first foreigner ever to receive this decoration. In the battle for the Agenta Gap the Commandos surprised the bridge at Menate. This battle was the beginning of the end for the Germans in Italy. The 4th Commando Brigade, originally composed of entirely Royal Marine units, under Brigadier B.W. Leicester, D.S.O., included during the last winter of the war No. 4 Commando. This Brigade’s great exploit was the capture of Walcheren, and in this operation No. 4, under Lieut.-Colonel R.W.P. Dawson, captured the greater port of Flushing, showing once more all the dash and skill which won them the renown at Varengeville and Ouistreham. It is often supposed that Commando units disdained such routine matters as administration. Nothing could be further from the truth. Commando Brigades were notably fortunate in their administrative staff, who, whether in the planning of raids or the sustaining of long campaigns, displayed remarkable imagination and perseverance. Moreover, in a Commando everyone came under starter’s orders. Quartermasters, Clerks or Storemen, were always ready to make their place in the firing line when occasions offered-and it frequently did! This is not a place to discuss the overall contribution of the Commandos to the allied war effort. Suffice it to say that the few raids on Norway in 1941 were enough to induce Hitler and his Staff to increase the garrison of that country, so that at the surrender it numbered no less than 300,000 men. Had these forces been deployed in Normandy or in Russia in 1944, the war might have gone very differently, and at least could have dragged on for several months longer. It is recorded that a certain Yugoslav, the widow Tomasic, once asked a Commando soldier why it was necessary for the Germans to come all the way from Berlin, and the English all the way from London to blow down her garden wall. Looking back after the lapse of twenty-one years one sees that this comment was not altogether unjustified. Yet these years of struggle and self-sacrifice were not in vain, nor is the Commando idea, the Commando spirit, the Commando heritage one which any nation can afford to either reject or to despise. 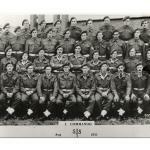 Click on a specific Commando unit below, or return to the WW2 Commando pages HERE.